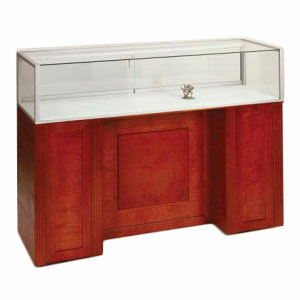 A pre-assembled, Quarter-Vision Jewelry Showcase, with a 12high display area, shown in solid cherry wood veneer with brushed silver anodized aluminum frame. Available in three different colors of cherry veneer -- dark cherry, light cherry and red cherry. We also offer mahogany, walnut and oak veneer. While ordering your showcase with a glass-to-glass front, the halogen or fluorescent octron light strip will be placed on the back of the unit. Dimensions: width 48", 60", or 72",depth 20",height 42"This product will be shipped VIA common carrier. Freight will be quoted separately. You will be notified of the freight amount.